Retired Marine Staff Sgt. 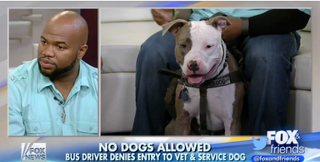 Daniel Wright and Tank, his service dog, appear on Fox & Friends. Daniel Wright, a U.S. veteran, was just trying to get home from school when he was denied a bus ride on a New Jersey Transit bus because of his registered service dog, Tank, a pit bull, Fox News reports. According to Wright, a retired staff sergeant, he was coming home from school when he attempted to board the bus. The driver reportedly closed the door in his face, saying, "No dogs allowed; no exceptions." Wright pointed out Tank's collar and vest, which identify him as a U.S. Army service dog, but the driver would not be swayed, Wright said, insisting that he was scared and that Tank needed a muzzle. Wright ended up having to wait for the next bus to arrive and had to present his military ID before being allowed to board at that time. "He's a good dog," Wright said of Tank, who joined him on Fox & Friends earlier this week. "He's not vicious. He's not trying to attack anybody." "They think [golden retrievers, etc.] are the only dogs that can be service dogs. Pit bulls can do the same job," the veteran, who served four combat tours, added. Wright was injured in Iraq by a roadside bomb. He has had nine surgeries on his left arm. Tank acts as an extension of that arm. "He can actually push buttons for me, open and close the refrigerator. If I need meds, he can go get my medicine; he can actually get bottles of water out the refrigerator for me also. If I have a panic attack or an anxiety attack, he calms me down," Wright explained, calling Tank a "daily necessity." Wright said a New Jersey Transit official called him to apologize for the driver's conduct, saying that the driver would be disciplined. The incident is currently under investigation.